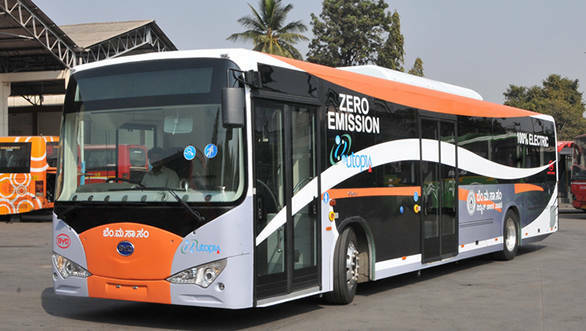 New Delhi will see its first electric bus ply from today. Delhi Transport Minister, Gopal Rai, flagged off the bus. The no-pollution bus will run from Delhi Secretariat to Central Secretariat from 6:30am to 9:20pm everyday. The minimum fare will be Rs 10. The bus takes four hours to charge and has a range of 280km. Spaking at the flag off ceremony, Gopal Rai said, "It is the first such bus in India which is 100 percent pollution-free, operates completely on electricity and used for public transport. The bus will run on trial basis for six months in Delhi and we will assess if more such buses could be added to our next fleet of 1,000 buses." The bus is made in China and is fully air-conditioned. It also features hydraulic suspension and has a seating capacity for 31 people, about 10 seats lesser than a conventional low floor Delhi Transport Corporation (DTC) bus. The operational costs for this bus will be Rs 12.06/km. The Delhi Dialogue Commission (DDC) had initiated the project after its vice chairperson,Ashish Khetan visited China in 2015. The Government has not paid for the bus since, it's being run on a promotional basis by its Chinese manufacturers, BYD Auto Industry Company, and the Indian importers, the Smart Group. The DTC, meanwhile, has marked out a parking spot for the bus at the Millennium Depot and also set up a charging facility for the bus. The Government will study the feasibility of the bus, over the next six months, after which it will take a decision to increase the number of buses.